This topic contains 16 replies, has 8 voices, and was last updated by esvath 3 years, 12 months ago. In my last game, I have three AI players built and lit the beacon. That was nice, knowing that the AI actively pursue victory. However, they built and lit the beacon before having second racial governance at level III. Thus, they had to defend the beacon from other AI players (which declare war against them as soon as they started building the beacon) and the attacking units spawned from the event. This seriously crippled their economy and made them lost many units. I think AI should try to build their beacons simultaneously, after they achieve two (or three, or four as required by the victory condition) racial governance level III. By simultaneously build the beacons and lit them, the AI player has to deal with shorter war period and hostile-unit-spawning-events. I dont know the AI, but last time i was not even close to win unity victory but i build it anyway just for the happiness bonus. Well, human players might be able to utilise the happiness from beacon and farm the spawned monsters for xp. But I think the AI is unable to do those; instead, “build a beacon asap” is detrimental for the AI. Agreed it is a problem at the moment. I have seen King AIs build a number of beacons while still unable to get the number necessary, and then have their cities taken from them by swarms of neutrals, killing their economy OR their entire existence. They need to be more confident they can hold them, or don’t do it. I hope someone from Triumph could check this. I do believe that building the Unity Beacon too early is detrimental for AI since its does not have the necessary power to deal with the neutrals. @tombles @narvek @eric, any thought? 1) The beacons are designed to be built ASAP, this why they give the happiness bonus/penalties they do. If we made the AI wait until it could build enough to win before it started, then either they’d never build them, or player’s would suddenly get a message like “Bob is building beacons here, here and here, you have 5 turns to stop him”. 2) The already has a bunch of stuff that causes them to heavily defend their beacon cities, but it’s obviously not enough each time. I don’t really want to reduce the size of the spawns in general, since it needs to be that strong for players to find it challenging. For now, I’m going to modify the system to spawn fewer independent attackers near AI cities. It’s a bit of a bandage fix, but I think any other fixes we deployed would have the final effect of stopping the AI building beacons in most games, which obviously isn’t what we want. I was trying out this win condition during my latest random map, and yes I got burned the exact same way as you: I was in good terms with mostly every one, and as soon as I started building the beacon, EVERY AI suddenly declared war on me and I was overwhelmed. It’s funny because when one of the AI started building their beacon, they were not declared war upon by everyone else. It’s a bit strange, because it means that if you are going to start building the beacon, then you better be ready for everyone else to attack you, with lots of troops. If you already have a massive and powerful army, then why not just go and kill everyone via conquest?? There is somewhat of a disconnect here in my opinion. Also are the random spawns when the beacon is lit really necessary? All the AI players will already go for your throat as soon as you start building the beacon, when playing against multiple AIs at high difficulty, isn’t it hard to pull off already? If you’re playing against multiple AIs at hard difficulty, don’t you want it to be hard though? Currently, it spawns 3 stacks of moderately high powered racial units, it’s mostly there because you can build the city in locations where the AI (or other players) can’t really get to you in time to stop you. Last time I saw people testing it, they defended their beacon cities with heavy armies, walls, defensive upgrades and spells. They just autocombated the attacking indies and lost like 2 units out of 18. I just asked about the diplomacy stuff, apparently the AIs will declare on each other when they build enough beacons. If you have a save which shows this not happenign, you can mail it to us so we can take a look! Currently, it spawns 3 stacks of moderately high powered racial units, it’s mostly there because you can build the city in locations where the AI (or other players) can’t really get to you in time to stop you. I found some kind of loophole that allows me to settle cities for beacons and the AI never touches them. It only works in underground though. This is from a save file where I got a beacon victory later by constructing a beacon in the city you see, as well as in another one with a similar location as this one. Apparently I finished the game in one haul after this save so this is my last save, autosaves have been overwritten by now. My main goal was to settle somewhere so the AI could only attack me with one stack at a time. But the thing is, that Magma Forge in the picture screws with the AI a lot. In my other city it was the thing that grants Stables of Vigor in a similar location. The AI can’t cross it or it can’t attack it if that hex is empty and my army is in a hex adjacent, or it’s just bad with dealing with structures in general? The result was a lot of 6-unit independent stacks in my domain, doing nothing. I constructed two beacons and won without having to fight. Thanks for the reoprt Dagoth! I’ve passed it ont othe Strategic AI guys to check out! Personally I don’t mind with me being attacked by hostile units after lighting the Beacon and attacked by AI players jealous of me being awesome. 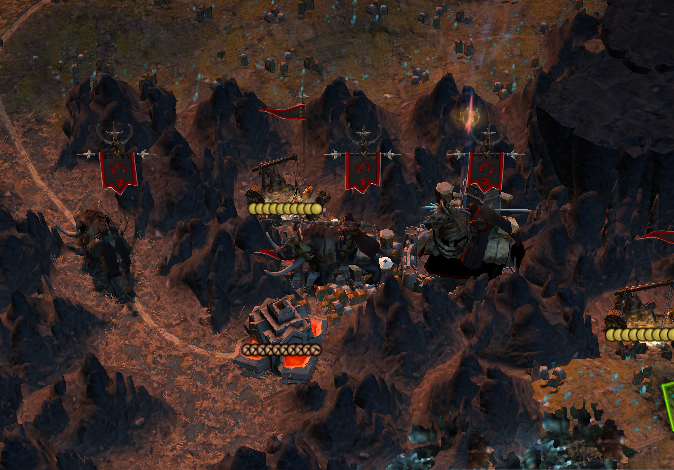 However, the AI has difficulties in defending themselves against multiple attacks like this. So, perhaps let the AI buffs its defenses before lighting the beacon(s)? Only one beacon was built by the AI and no declarations of war were made, but on the first term I started building mine, all hell broke loose (Don’t have the save anymore though, which is unfortunate). I guess that maybe it takes more than one beacon? I’ll give it a try tonight! In my case, AI players did not declare war to another AI which started building the Beacon because the other AI players had not had contact with the builder. This might be because AI players are not scouting fast? I strongly agree on esvath suggestion that the AIs should only consider to start building the beacons when the numbers of required racial governance has reached lvl3. @tombles with regards of your worries that the players do not have enough time to response if the AIs built all beacons at the same time… IMHO is invalid. Firstly upon reaching the required number of RG to lvl3 is a pre-warning. Secondly if the AIs has save up 2400 gold and 2400 mana to anticipate his victory it deserve to win. They should only build a beacon when they have enough units in the town to reliably defend against the expected assault. That should also include defensive structures and spells. It should dig in with three stacks of its finest units and every spell at its disposal applied. At least that would imitate player behaviour to a point. I agree, unfortunately life isn’t that simple! Strategic AI changes are very hard to do, and if we were to wait for a change like this, then it would be broken for months before we could fix it. This way, at least you won’t see the constant “Bob is lighting his beacon!” “Bob lost his beacon” in half the games you play. How about upon reaching racial governance III, AI gain bonus for its defense? A free wall, for example (although in my experience, AI already built wall and defensive structures in almost all cities. They just need more units to defend the beacon against multiple attack).